Justin Trudeau is the “skunk” who “screwed everybody”, according to the international leaders he left “fum[ing]” over the “scuppered” Trans-Pacific Partnership renegotiations. The Trans-Pacific Partnership was signed in February 2016 by 12 countries, representing 40% of the world’s economic output, but was never implemented. In January 2017, Donald Trump pulled the United States out of the agreement meant to deepen economic ties, leaving the 11 remaining countries to choose between letting the deal die or renegotiating without the US. 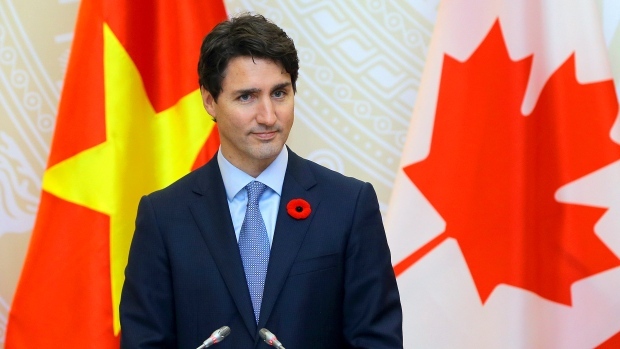 Many thought that an agreement would be reached between the 11 members on the sidelines of the Asia-Pacific Economic Co-operation forum in Vietnam in November 2017, but the meeting between the leaders was cancelled after Prime Minister Justin Trudeau did not attend. Amid Canada’s reasons for not signing the deal are a lack of progressive chapters on issues such as gender equality, a lack of protections for cultural industries like Canada’s francophone minority media, and clauses that could potentially clash with Canada’s goals in the ongoing NAFTA renegotiations. While Trudeau is receiving his first bout of serious criticism from the international community since he took office over two years ago, delaying the trans-pacific partnership is actually the smartest move he could have made. Delaying an agreement on the TPP has allowed Trudeau to affirm his authority on the international stage, and to show voters back home that he is prioritizing Canadian interests. The American withdrawal from the TPP leaves Canada as the second largest economy in the agreement, after Japan. With Japan eager to rush into a deal to stymie China’s power,, Canada needs to assert its authority more than ever to prevent being dominated by Japan. Trudeau has made it clear that he won’t succumb to pressure from other countries, and will take the time needed to ensure the deal is “right for Canada and […] right for the world”. This demonstrates to the other 11 countries that with the United States out of the picture, Canada is prepared to take on a position of leadership, and won’t be bullied into the sidelines. The void left by the US in the TPP presents a unique opportunity for Canada to take on an expanded role in the global economy and to make its mark on the international stage. Trudeau would be foolish to pass this up by rushing into an agreement. Not only should Canada be expanding its influence economically, but Trudeau has clearly been attempting to leave an ideological footprint on the agreement. He has pushed for the inclusion of sections in line with his progressive domestic platform on climate change, labour rights, and gender equality. Because Trudeau has already made these priorities clear, it would be unwise to back down by signing onto an agreement that did not include these demands. Delaying the agreement has allowed Trudeau to assert Canada’s power globally, now and into the future. The United States may be out of the TPP, but this doesn’t mean the Trump administration isn’t watching the Prime Minister’s every move. With the American president eager to renegotiate a NAFTA deal that favours his protectionist economic policies, Trudeau must show Trump that Canada will not be intimidated into an agreement that benefits the United States at Canada’s expense. Many of the clauses that Trudeau wants implemented before signing the TPP are similar to the Canadian government’s stated goals in NAFTA renegotiation, such as furthering gender equality and upholding environmental standards. Putting his foot down in the TPP sends a strong signal to the Trump administration that Canada will not be a weak bargainer in a re-negotiated NAFTA. Trudeau’s delay in signing the TPP is a demonstration of power to the international community, as well as a reassurance to Canadian voters that he is operating with their best interests in mind. Canada faces an uncertain future in other trade deals, such as NAFTA. As such, Canada must take the time to create a strategic and comprehensive trade deal that will protect its interests and ensure stability within an increasingly uncertain trade playing field. Former trade minister’s aide Adam Taylor, argues that now more than ever is the time to “step back, evaluate Canada’s long-term offensive and defensive interests and adjust the TPP to present-day realities”. Taylor was formerly an aide of the Conservative government; his support demonstrates that Trudeau’s actions are not only best from a Liberal perspective, but from a multi-partisan one. With a large economy and unique cultural and economic interests, “Canada has significant skin in the game”, and rushing into a deal “is antithetical to strategic long-term planning and goes against Canadian interests”. Taking additional time to review the deal will allow Trudeau to ensure that minority francophone media is protected, and that Canada does not face a penalty for protecting minorities. Trudeau’s refusal to sign an imperfect agreement has allowed the Prime Minister to “remind everyone [that] Canada will not be rushed into a deal that is not in the best interest of Canada and Canadians”. Trudeau’s delay in signing led to TPP trade ministers agreeing to changes in areas that Canada had been pushing for, including the auto industry, cultural protections, and changes to clauses on IP. Trudeau’s delaying of the TPP agreement led to immediate benefits for Canada, signalling its effectiveness in furthering Trudeau’s “Canada-first” moment. In addition to producing tangible benefits for Canada within the text of the TPP, delaying the deal may boost Trudeau’s general popularity back home. Trudeau has illustrated to Canadians that the Trudeau Liberals will put Canadian interests first. Trudeau’s principled declaration that “culture is more than just an economic good” and his concern for matters that “shap[e] the identity of [the] country” could increase approval from his current support base. Additionally, his rational deliberation on trade matters and an apparent desire to protect Canadian industry could pull more conservative Canadians to his side. With Trudeau halfway through his first term, it’s never too early to start attracting voters for the expected 2019 federal election. With approval rates falling, the Canada-first approach that the Prime Minister unveiled at the sidelined TPP negotiations could be exactly the domestic popularity boost that Trudeau needs. Justin Trudeau played a power-move this past month in Asia, and while it resulted in angry headlines around the world, it was an overwhelmingly smart play. Delaying negotiations on the Trans-Pacific Partnership allowed Trudeau to capitalize on a unique opportunity to lead international trade in the absence of the American superpower, while also presenting Canadians with a Canada-first approach that is sure to please voters come election time.